Stephen Peroutka is convinced that education is the way to change hearts and minds on abortion and other issues of life and death. That’s why the parishioner of Our Lady of the Fields in Millersville has launched National Pro-Life Radio, an Internet-based network that broadcasts pro-life programming 24 hours a day. “We’re not just preaching to the choir,” said Mr. Peroutka, a local attorney and leading pro-life advocate who is chairman of the board of governors of the National Pro-Life Action Center in Washington, D.C.
“The idea is to spread the pro-life message to everyone,” he said. Broadcast at www.nplr.net, the network features nationally known hosts including Father Frank Pavone of Priests for Life, Jay Alan Sekulow of the American Center for Law and Justice and Day Gardner of the National Black Pro-Life Union. Topics cover a broad spectrum of issues including abortion, embryonic stem-cell research, euthanasia and chastity. News articles and videos are also offered on the Web site. The network recently provided live coverage of the March for Life in Washington and the Maryland March for Life in Annapolis. Wearing his headphones as he recorded a recent show in his Pasadena studio, Mr. Peroutka interviewed Kevin Healey, president and general manager of the Baltimore Blast indoor soccer team. The two touched on the importance of treating all people with respect and community involvement of sports players. Mr. Peroutka told The Catholic Review he discovered many of the hosts on the network by talking with people who are passionate about the pro-life movement. Mr. Peroutka said it is more economical to broadcast via the Internet than attempting to purchase a radio station. It also positions the network well if Internet programming becomes more widely available for broadcasting in automobiles and elsewhere, he said. “We want to be ready for when that day comes,” he said. 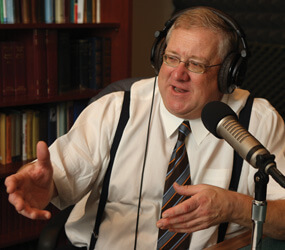 Paul Schenck, pastoral associate in Priests for Life, helped Mr. Peroutka develop the idea for the radio network and serves as a program host. The network is supported with the financial backing of two private foundations.